Keepsakes are some of the most special posessions we have. Remembering someone or something from the past gives us a nostalgia that we love. These keepsake boxes are the perfect way to keep your special items safe and sound. 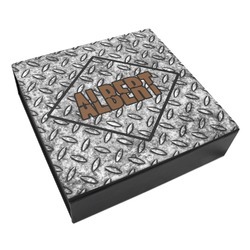 This keepsake box is made of a durable material on top and a leatherette material on the sides. It comes in 3 different sizes: 8"W x 8"H x 3.25"D, 10"W x 10"H x 2.65"D, and 12"W x 12"H x 3.25"D. Pick the right size for whatever you want to keep inside. Keep letters, photos, or even baby clothes to remember the good times. The inside of the box is lined with a soft velvety material. The box opens from the top and flips over on one side to keep your box securely closed. To care for your box, simply use a lint roller on the outside occasionally. Wipe with a soft cloth that has warm water and mild soap on it to get any dirt off. Get going in our design center to create the perfect nostalgic design for your box. 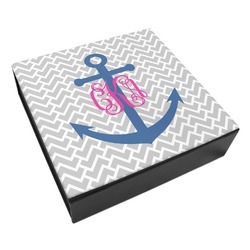 Pick a fun pattern, whimsical font, or graphic to go on the top of your box. Even upload a photo or image yourself. Have fun creating the place where you store your memories. If you have any questions just give us a call. This is a great Gift to give to a spouse or significant other! Place some special memories inside and give it as a gift. If you need a different kind of gift, be sure to look at our Gifts For Her and Gifts For Him sections where you'll find passport holders, steering wheel covers, notepads, makeup bags, and more.